At your core is a beautiful pearl, shimmering, iridescent and vibrating love. You were born like this but the pearl soon got buried under the weight of thought. You were taught that the best thing you can do is to think. The thinking mind has been prized for centuries as the apex of intelligence, the pinnacle of consciousness. And so the precious pearl got buried under the weight of thoughts, ideas and belief systems. From birth your mind has been filled with stories about who you are and what the world is. A steady drip of stories gradually turned into a tidal wave of thinking that engulfed your mind. And now it spews a constant tsunami of useless, second-hand thoughts. Under their weight the pearl has drowned. It is lying at the bottom of the ocean of your mind, laid to rest for all eternity unless you WAKE UP. You are not your thoughts. 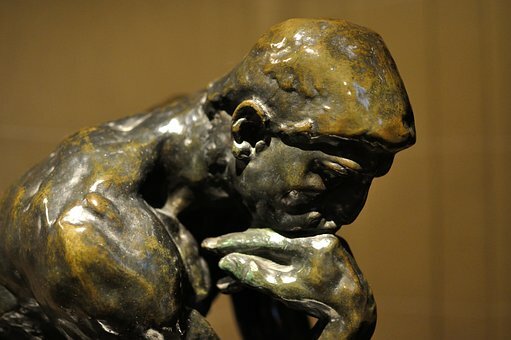 Thinking has a very important place in our psyches and is fine to use it when the occasion arises. The problem is that we are thinking all the time. It is the world’s number 1 addiction. We have been brainwashed into believing that, as Descartes famously proclaimed: “I think therefore I am”. It would be more apt to say: “I think therefore I am…screwed”. Thoughts turn into beliefs, i.e. just thoughts that you keep thinking. Most of these repetitive thoughts have taken refuge underground in your mind and now run the show that you call your life without your knowledge. You identify with your beliefs as if they had an objective reality. They do not. They are simply habits of an uncontrolled mind. Spend just one day being aware of your thoughts as they arise. Notice the busyness of your mind and see how it teams with unexamined thinking, stinking detritus from the outside world that you’ve taken on board, flooding your mind with useless ideas. Look for one single belief that is truly yours, one idea that didn’t come from the outside world. You will soon discover that your mind is not your own. It has become a prison you created by listening to other peoples’ thoughts. The way out of the prison is lit by Aha moments of insight. Aha moments arise in a quiet mind, a still mind that is not bothered by thoughts. This doesn’t have to be hours of meditation but conscious, regular gaps in thinking. People have huge Aha moments when they mind the gap, when they surrender their thoughts. They consciously impose a small opening between thoughts in which insight can emerge. If you sit in a space of “don’t know” mind you begin to clear the detritus, giving space for a wiser, more intuitive place within you to make its voice heard. So don’t be a great thinker, be a gap-maker. Be present in the moment and connect to what is happening in your life and not in your head. You will realize that there is a much greater intelligence than your thinking mind awaiting your attention. And when you connect to this higher, interconnected wisdom, you will intuit the re-emergence of the pearl of love that you are.